No Fenders -Formula 1, IndyCar and A Whole lot more..: Follow Your Schnonz... Be Just like TK! And NO! I DON’T mean like hittin’ duh Wall twice in one weekend... CRIKEYS! As now Y’all can be just like Tony Kanaan who recently”I- spied!” on that Mesopotamia of a Motorsports website, laughingly known as indycar.com... As first there was the iPhone, then next came the iTouch and now comes the iPad! AS I’ll spares Y’all over my never ending frustration with Technology, as in Gee – Thanks WICKEDpedia for changin’ to 4-dot font; SHEISA! Try reading ‘Dat when you’re a Visually Impaired ‘Vurd Botcherer... Aye Karumba! But I digress... As perhaps you’ll wanna be the first on the block, Err Brickyard’s Grandstands with your snazzy new fangled iPad... As I’m assuming they’re permitted in The Speedway? Mitch has just sent me the following “Testimonial” for a brand new App he’s promoting. As I mentioned on Tuesday, I’m sending you some information about a terrific new way to keep up with IndyCar. 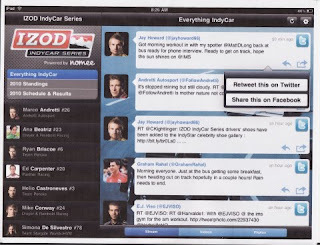 As a tech partner of the Indy Racing League, my company, nomee, is now launching the IZOD IndyCar® Series iPad application. This link will open a browser that redirects to open iTunes to the download page for the FREE application. 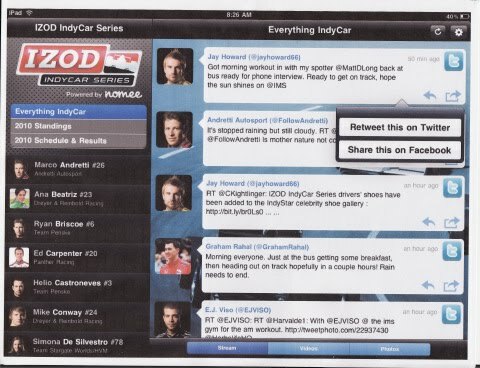 Using this sleek new app, IndyCar fans can now get up-to-the-minute updates from the league and its top 30 drivers. All of their social streams, photos, videos, and comments are included in this one dashboard. Fans also have one-touch access to tandings, schedules, and race winners. All of the content can be viewed inside the iPad app, including streaming high-quality video and photos. It’s a fan’s ultimate IndyCar media center all in one place for FREE!